Buffalo Chickpea Snack Mix makes the perfect snack with roasted crunchy chickpeas, Cheez-Its, nuts, pretzels and popcorn and a flavorful buffalo sauce! In my household, we love snacks! Any time of day, someone is eating a snack. Adalyn wakes up asking for snacks. I get super munchy mid-morning and later afternoon. Troy likes late-night snacking. One thing that we all have in common is that we love tons of snacks. I have been wanting to make my own homemade snack mix for awhile and finally got around to making it when I had some delicious salty snacks on hand. We love all things buffalo flavored which is how I decided to make this mix that flavor. You can use whichever snacks that you have on hand- you can use more cereal, any shape of pretzel, different kinds of nuts, etc. Whatever you like as long as it is pretty crunchy should be fine. At the last minute, I decided to add in my Roasted Chickpeas which I know that you all love because it is one of my most popular recipes ever on the blog. It adds some protein and fiber to the mix and is the perfect crunchy treat. I made this mix with the thought of Halloween in mind. While we do not currently pass out candy because we go out of town for the evening of Halloween, I do like to make Halloween goodies. Halloween treats go far beyond candy and do not even need to be sweet. My mom for example loves salty snacks so she would definitely prefer this over having a sweet snack. I wrapped these cute little bags of Buffalo Snack Mix with an orange ribbon for Halloween. It would make a cute gift for neighbors or other people that you know. When I was little, my neighbors would bring over Halloween gift bags for my siblings and I and every so often, they would contain homemade treats. This would be perfect for that! If you are having a Halloween party or even a fall party, tailgating or a holiday party, this mix is sure to be a winner. It is a bit addictive and you may find yourself reaching for handful after handful (not that that happened to me....). 1. Preheat oven to 400 degrees. Dry chickpeas with a paper towel. On a baking sheet, toss chickpeas with butter and mix. Bake for 20 minutes, stirring once. 2. Mix together the roasted chickpeas, Cheez-Its, nuts and pretzels on baking sheet and mix in hot sauce with ingredients. 3. Mix in popcorn and bake for 10 minutes until all items are crispy (pretzels and Cheez-Its may get a little soft when you mix in hot sauce). 4. Let cool and enjoy immediately or that day. Hover over the image above to start shopping for fun Halloween snacks! For this recipe, I used Cheez-Its from Kroger along with a bunch of other salty snacks. Kroger had a great variety of snacks to pass out for Halloween- I visited Kroger but you can visit any Kroger banner store as well. They had Pringles® and Kellogg's® Rice Krispies Treats® as well as the Cheez-It® snack packs which can all be given out as Halloween treats instead of candy. They are also fun for kids (or adults) lunches for on-the-go snacking. 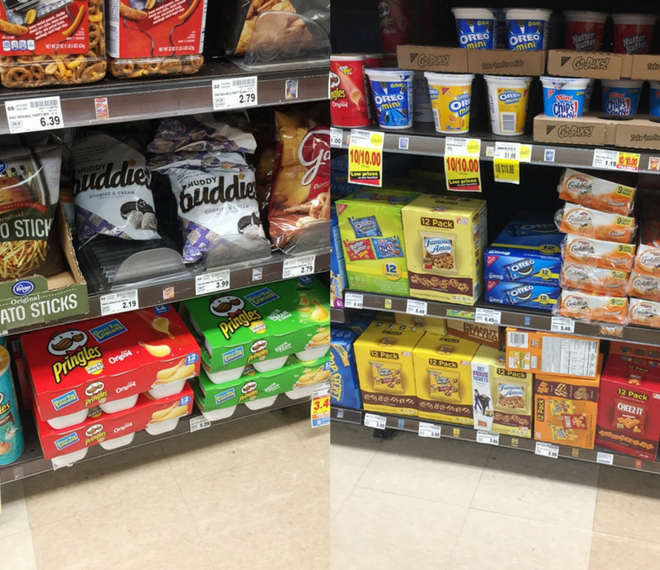 Check out great deals ($1 off your purchase from 10/2-11/2) and limited time special pricing on Pringles Snack Packs and Keebler Cookie and Cheez-It Variety Packs at your local Kroger or Kroger banner store! Check out the social hub for more inspiration.